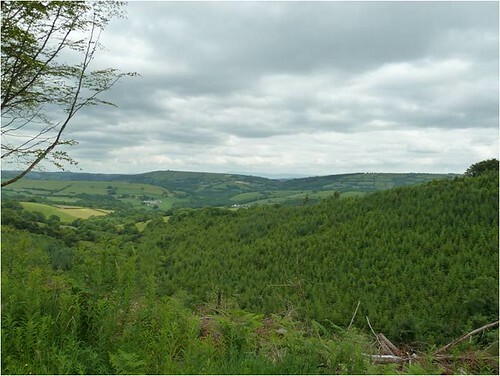 When an 18.5km trail gets graded black in Wales, you know it’s not the length of the ride which classes it as severe, so what does actually make this trail a technical challenge? 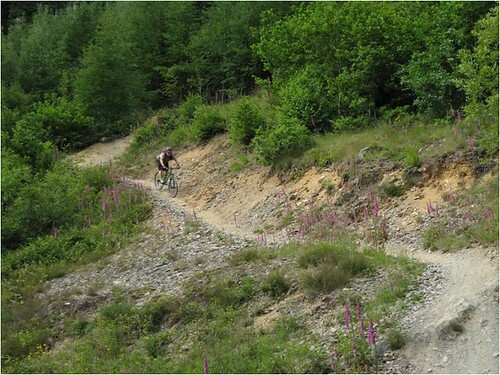 With this in mind, this trail was one of the most eagerly anticipated rides of our week in Wales. ‘Designed by Rowan Sorrell’, those few words offer reassurance about a trail especially when you take into consideration some of the other projects that he’s been involved in. The downhill at Cwncarn and the flowing lines at Lee Quarry to mention but a few trails that were sprinkled with his fairy dust. As I haven’t yet ridden one of his trails so I was excited to find out what all the fuss was about! On arrival you pull up in the free car park and are faced with the Drop Off Cafe double decker bus... which was closed. It’s only open at the weekends, which makes sense, and anyway, we were going to get the trail to ourselves for the afternoon so we didn’t really mind! You have to remember that even though Brechfa has several trails in close proximity, it’s still classed at a Trail Base not a Trail Centre, and as such there are very few facilities on site. A few porta loos are about the limit here! 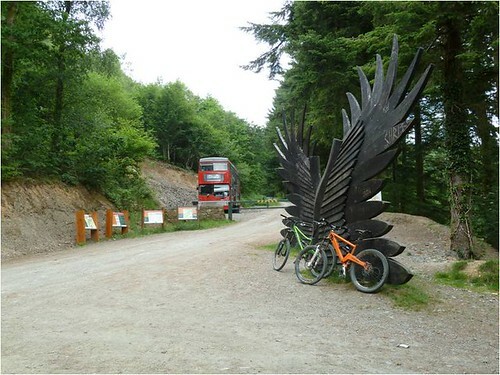 The Raven Trail starts off on a stretch of forest road which is shared by the Derwen Trail, it goes on for a while before you hit the first sculptured section of singletrack. The section appears to have been built to make it easily sessionable, which is a good thing as it starts off again being shared with the Derwen Trail which then veers off into some black scull ‘n’ crossbones sections. This isn’t totally obvious when the Derwen trail drops into a lovely left handed berm and the Raven Trail takes a steep path to the right of the so said berm. You would definitely benefit from taking the time to learn this section to get a good flow from it, but I guess that’s the point. The last thing you want to do is spend to long there though as the black grading starts to sharpen its teeth in the following section. The first climb draws you in and it’s quite a slog. It starts off in a steep gully that takes you straight up into the forest which then takes you on a slowly rising tight piece of singletrack that really tests your legs. We probably shouldn’t have ridden the Gorlech trail just before heading out on this one as a fresh pair of legs is definitely advisable. As the trail rises it starts to flatten out and you start to settle into the ride and soon enough the trail starts to point in the right direction, down! A few nice sections of singletrack lead you to a wonderfully natural technical descent which winds nicely through the trees and drops through some rooty sections that finally bring you out at the beginning of another climb. As with any great trail, you have to gain elevation in order to appreciate some great descents and this trail is no different. The trail continues to climb before hitting its first major downhill section which features some huge berms and great flowing sections. It’s quite a contrast to some of the extremely natural woodland sections that proceed it, but you can see that plenty of effort has gone into creating a great section. Again you get the feeling that the more you ride it, the better the flow you will achieve. All too soon the trail starts to point upward again, and this time it climbs slowly and purposefully to its highest point. Starting off steadily for the first few kilometres it lulls you into a false sense of security as right into the third kilometre of this climb the trail sharply steepens sapping your energy before flattening slightly into a long slog to the top. Once at the top there are a few sections of singletrack that flow nicely before you hit the final few climbs that lead into the final sections, which happily all point downhill. There is around four kilometres of singletrack that descents back through the trees and the further you get into it the better the flow as you start to get into a good rhythm. The sections are varied from raised armoured trail, to dense woodland, to highly sculptured berms, all testing you skills to the limit as you push on through them. As you start to reap the rewards of the slog uphill that you have just experienced, you start to fully understand the black rating of this trail. 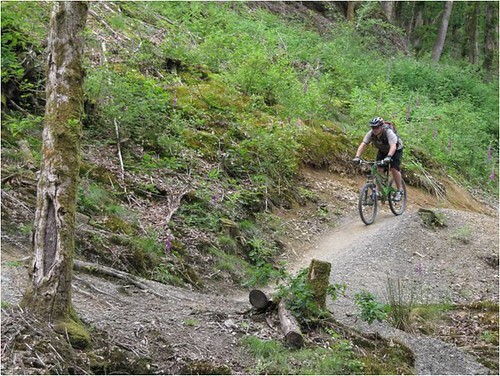 It really does test both your fitness and riding skill and you start to sense that this is the kind of trail you want locally so you can carve yourself into a fitter and better rider. As you reach the final sections there is one last climb before you rejoin the forest road that you first started on a few hours before. There is one last section of flowing singletrack which has some nicely placed jumps and berms which deliver you back to the car park. All in all this is one trail that although you are happy to get to the end in one piece with your lungs still in your chest and all your bones intact, you look back at the trail and think, I could have ridden that section better, or, if only I knew what was coming I could have nailed those berms properly. 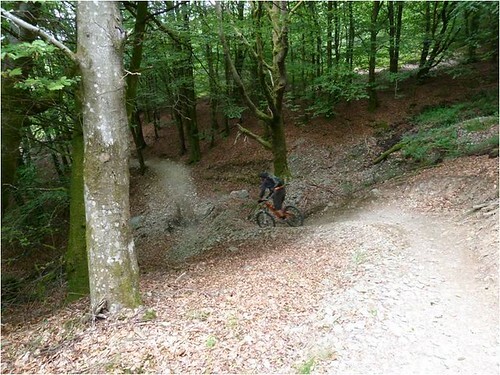 This is one trail that will take a few passes to master; it is just a shame that it is so far into Wales that it’s not easily accessible for a regular ride! The Raven Trail is great! I've ridden it a few times and it is a challenge but bags of fun. I also like Gorlech, the red trail. There still plenty of climbing but it seems easier. I;m the same though, It takes me a lot longer to get there so I don't go as often as I'd like to.